The fourth stone is a mahogany obsidian stone. If drawn to this stone, your subconscious is trying to say that it’s time to break out of old habits and routines and create a new life. Remember how lucky you are and how grateful you are of everything and don’t let jealousy creep into your mind. The fifth stone is called howlite. 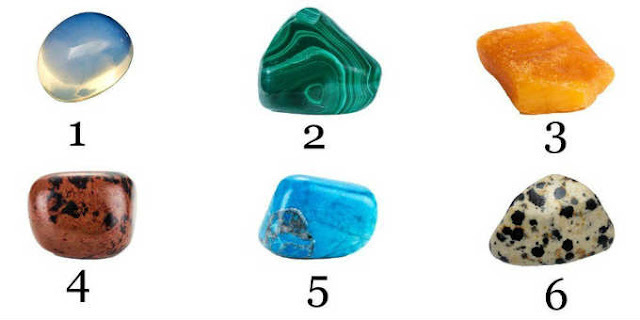 If you’re attracted to this stone, keep your mind open for messages from the “other side.” These messages may come from other worldly beings or passed relatives and loved ones. Keep a dream journal and be aware of visions or synchronicity. The final stone is dalmatian jasper. This stone indicates that you’re fun loving and need to keep play alive in your life. Seek out new adventures and make new friends. Having fun will win the day for you.